This is a good news story. Cracker barrel is a chain of traditional down home style country restaurants located along major highways in the South, Northeast and Mid West. Their food tends to be wholesome and predictable from outlet to outlet. They also sell merchandise. Politically correct punishment was swift John Rogers, writing for the Associated Press (December 21, 2013) explained: “Robertson had been placed on indefinite ‘hiatus’ for telling GQ magazine, among other things, that gays are headed to hell, more than a half-million people liked an impromptu Facebook page demanding the show be boycotted until he returns. Former Alaska Gov. Sarah Palin, who had her picture taken with Robertson just last month, complained that his free-speech rights were being trampled. Bobby Jindal, governor of the state of Louisiana, where the show is filmed, complained that Miley Cyrus got a pass for twerking on TV while Phil got shown the door. ‘It’s a show that is promoting clean living and good moral values, and that’s something we need more of today,’ one of the programme’s many fans, Rick Peter of Vernon, British Columbia, Canada, told The Associated Press. But, then, the fans fought back. 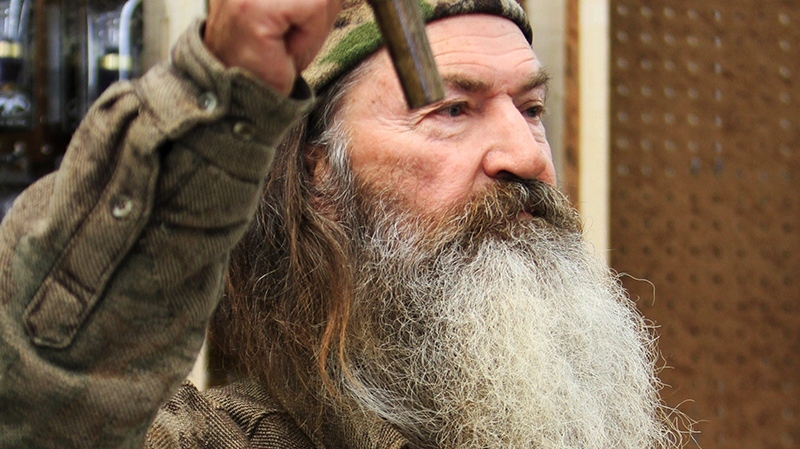 Many people are fed up with the censorship stranglehold the homosexual lobby has even in the supposed “land of the free.” The Internet and facebook were ablaze with outrage and calls for a boycott of A&E and demands for Robertson’s reinstatement. CNN reported (December 21, 2013): “. A Change.org petition demanding that Robertson be reinstated and the network issue an apology was steadily climbing toward 100,000 signatures Friday. A separate petition at a website called IStandWithPhil.com makes a similar appeal. Hosted by the online community Faith Driven Consumers, the website helps its members spend their money with companies that fall in line with their spiritual beliefs. The petition on IStandWithPhil.com had surpassed 130,000 signatures by Friday evening. Well, back to Cracker Barrel. In politicially correct America, often when a victim of the thought police is wounded others pile in to inflict further torment. That’s what Cracker Barrel did. On December 20 the restaurant chain issued a statement saying they were removing certain merchandise associated with the Duck Dynasty programme. “Cracker Barrel’s mission is Pleasing People. We operate within the ideals of fairness, mutual respect and equal treatment of all people. These ideals are the core of our corporate culture. We continue to offer Duck Commander products in our stores. We removed selected products which we were concerned might offend some of our guests while we evaluate the situation. They hadn’t counted on their enraged traditional supporters. Their Facebook page was choked with angry protests and suggestions that many people with traditional religious beliefs were rethinking plans to hold lunches or get togethers at Cracker Barrel. In less than 48 hours, Cracker Barrel re-dedicated itself to freedom of expression and religion and reversed its position. On Facebook, within nine hours of the reversal, a staggering 64,453 people had clicked “like” on the decision, as opposed to just 4,183 over a two day period who had approved of the original decision. Indeed, silence in the face of censorship is just not an option! This entry was posted in Uncategorized and tagged A&E, Cracker Barrel, Duck Dynasty, homosexual lobby, Phil Roberston by admin. Bookmark the permalink.